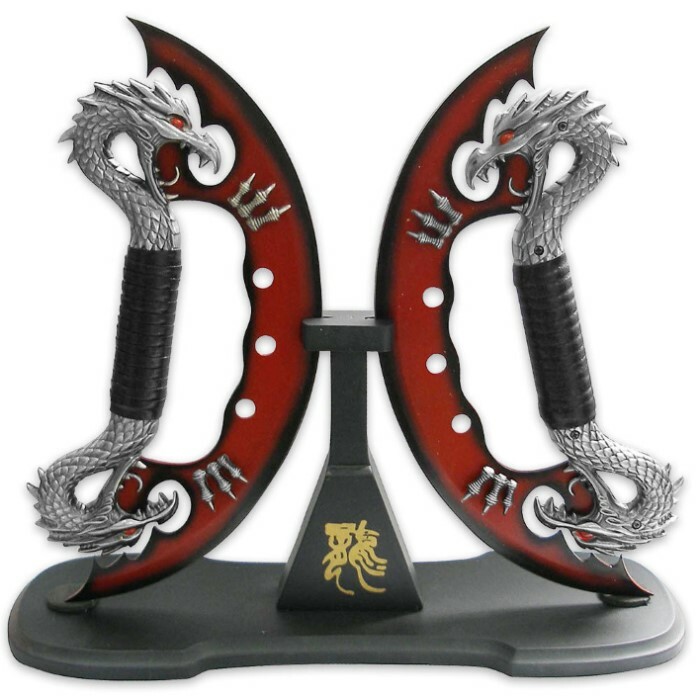 Dragon Crescent Moon Knife Set | BUDK.com - Knives & Swords At The Lowest Prices! This Dragon Crescent Moon Knife Set is the perfect addition to the fantasy knife and/or sword collection. Featuring two 440 Stainless Steel 11" razor sharp blades, you're sure to be impressed with the intricate details of this fantasy piece. The handle features a screaming dragon with fire eyes and dragon claws that extend to the blade of the knife. What are you waiting for? Pick up one of these Dragon Crescent Moon Knife Sets to be the center of your knife collection today! Very ornate and gorgeous. Pics don't do it justice. Turned around, they remind me of Xena's second chakram with the handle. I'm having these set into blocks for bookends, but can still remove them if needed. Simply beautiful! The picture does not do them justice. They are awesome looking and there is enough space between the handle and blade for sap gloves if you wish to add a little more force to the blades and also allows a backup. If the blades break you are still not unarmed, just throw the handles down and use the sap gloves to start punching. Perfect for display or combat. Beautiful set that compliments and completes the "Dragon Scimitar Fantasy Red and Black Sword" that's listed under the Dragons tab. The wraps came undone quickly but it was simple to just glue them down. The edges are nice and sharp and the handles offer a firm grip. They look incredible either hung up or displayed on the stand, and they are a stunning display when paired with the sword I mentioned earlier. I would recommend ordering both products together for an incredibly awesome display! This item looks even better sitting on my shelf than it did in the picture. Packaging was done well and shipping was very prompt. Only issue I had was there were not mounting screws for the center support inside the box, this was not an issue from Truesswords, they just weren't packed from teh manufacture. All in all a very nice piece. These things are razor-sharp. Exercise caution when removing the edge-guards. They're beautiful, and the craftsmanship is superb. The stand is nice and sturdy, too. I hear a rattle every now and then, and I suspect a claw or two may be loose. I'm not stressing over that though, because I intentionally swung these blades with force and nothing came apart. The only thing that could be classified as a downside was the delayed delivery, but...a day isn't really that much of a delay when you think about it. This is nothing short of a must-buy. It's art that can kill you. Doesn't get much better than that.